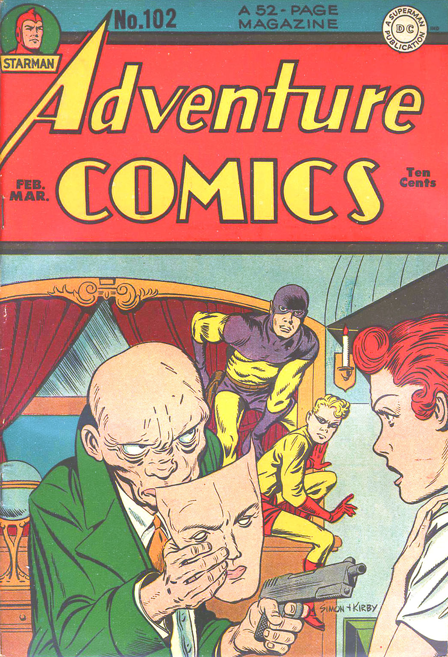 The Sandman story inside has nothing to do with the cover, but it is the lead feature for Adventure 80 (Nov 42), and Sandman had not been in the opening spot since the introduction of Hourman. 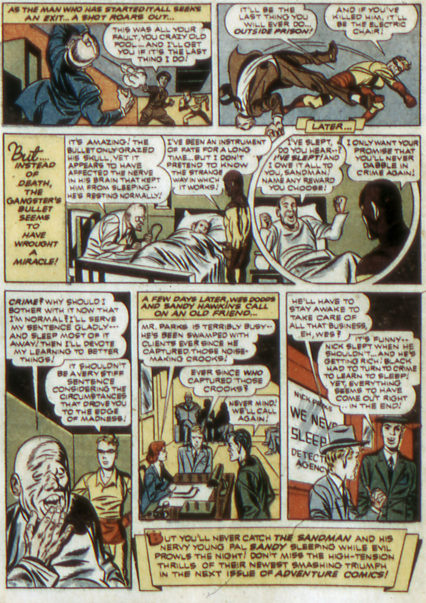 Sandman faces off against Felix Black, an insomniac whose ailment embitters him and turns him to a life of crime. Wes and Sandy help an out of work detective from the “We Never Sleep” Agency track him down. Meanwhile, the hoods Felix has hired realize how wealthy he is, and turn on him. Felix even gets a happy ending! 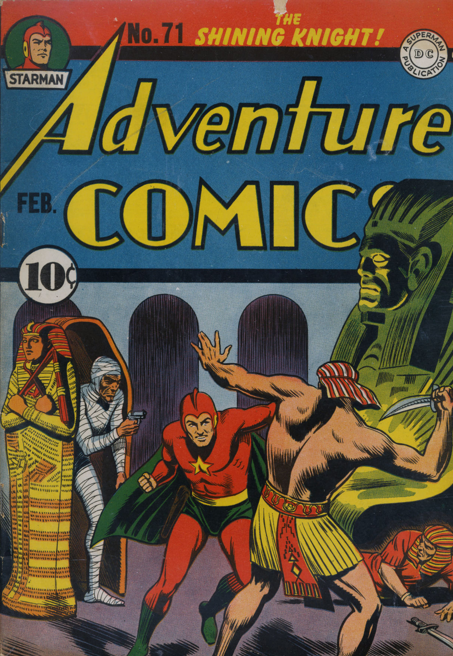 An entertaining piece, one of the few where Joe Simon’s writing is stronger than Jack Kirby’s art. 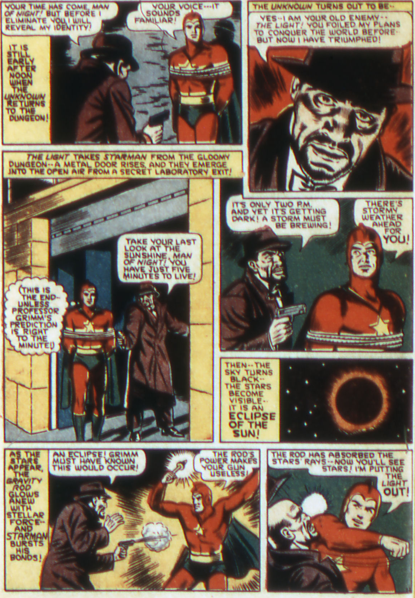 This is the final Starman story with art by Ray Burnley. Once again a time machine is at the centre of the action, as hoods use it to recruit, of all people, Shakespeare as their mob boss. 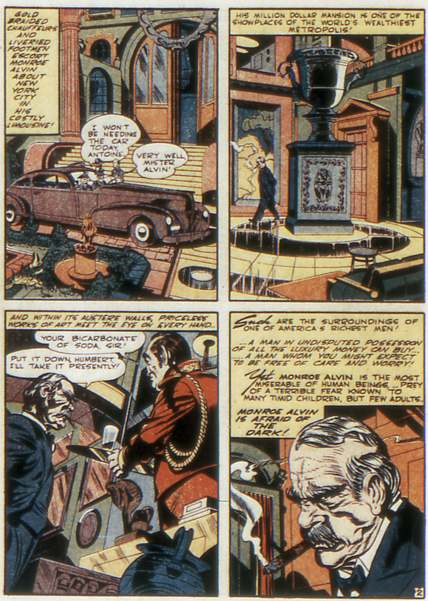 The last couple of pages look rushed and sloppy, I’m not sure they are even Burnley’s work, and the resolution really doesn’t make much of Shakespeare or the time machine. A great set-up that fizzles out. Sort of like the Starman series as a whole. 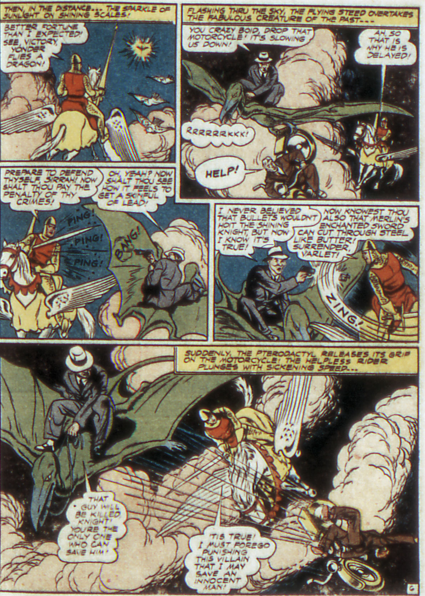 The Shining Knight gets a better story than usual, pitting him against gangsters riding pterodactyls! 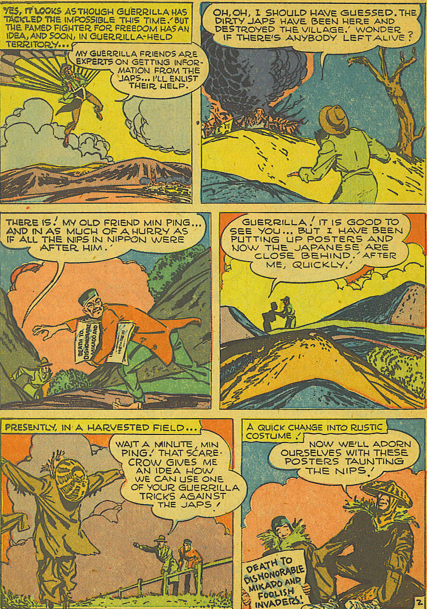 Porky Callahan, a pickpocket, ups his game by stealing the eggs for the dinosaurs from a museum and hatching them. 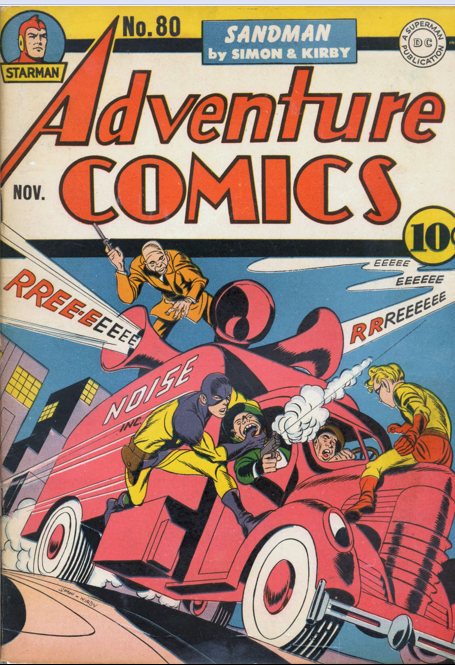 His gang quickly realize the criminal potential of the animals, which are not as difficult to ride as one might think, at least not in comic books. 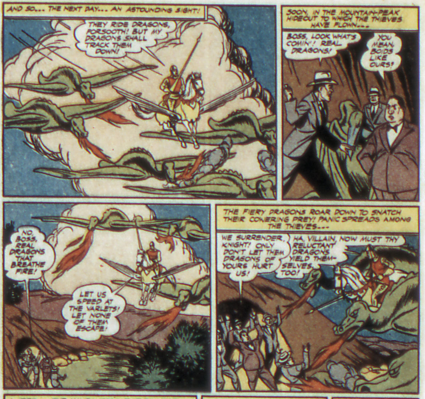 The aerial battle is better than anything this strip has seen so far, and I forgive the resolution, in which Sir Justin shows up with a band of fire-breathing dragons he got from, ummm, don’t ask. 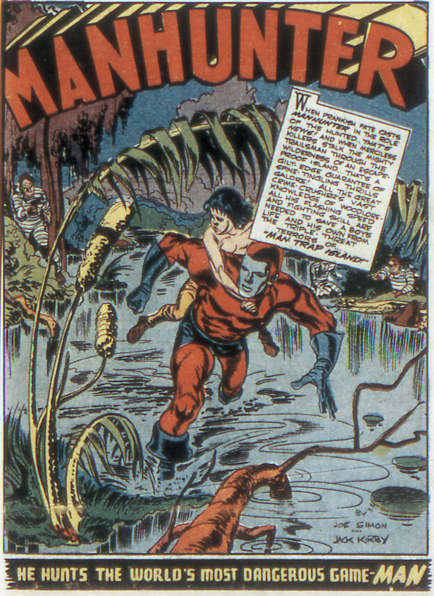 The Manhunter story is more intense than usual, opening with a prison break somewhere in the south, it seems, as there is a large swamp with natives living in it close to the penitentiary. Even though the Manhunter series is usually mostly fighting, in this one it is almost frightening. 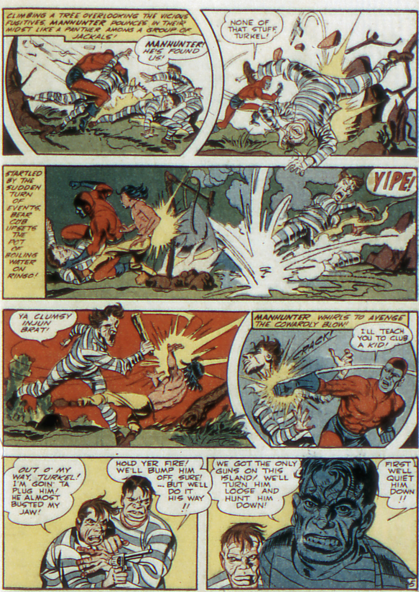 Manhunter catches up to the men just in time to save a native boy from them. This story, more than most of the others, leaves the reader really rooting for Manhunter. 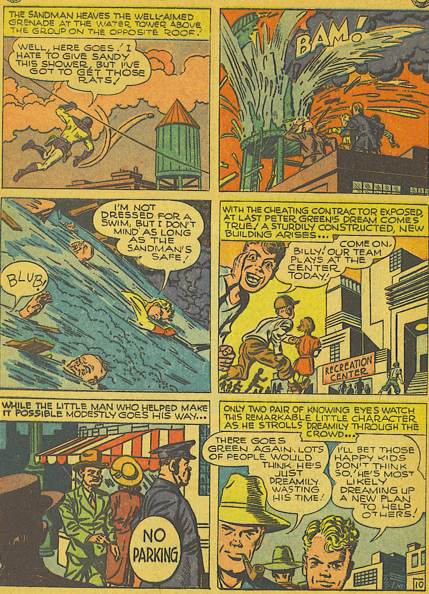 Possibly just because a child is in danger, but Kirby really does a great job making the cons look threatening. 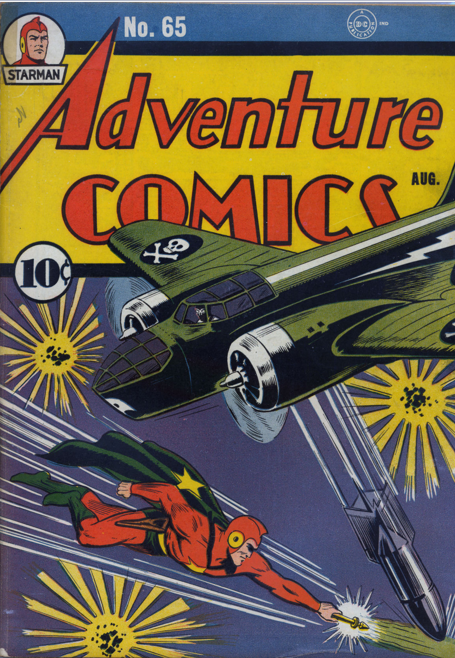 No connection at all between the cover for Adventure 77 (Aug 42) and the Sandman story it contains, which may make it easier to cope with as I discuss the other stories first. The Mist escapes from prison, having figured out how to chemically treat objects to enable him to mind control people who have touched them. Pretty impressive achievement. You’d think there would be endless legal ways to make money off of that, but crime works as well. It seems like Starman has been doing some research as well, as the gravity rod is now capable of nullifying the effect of the Mist’s invisio-solution. This second battle between them is a satisfying rematch, but also the last appearance of the Mist until the 1960s. 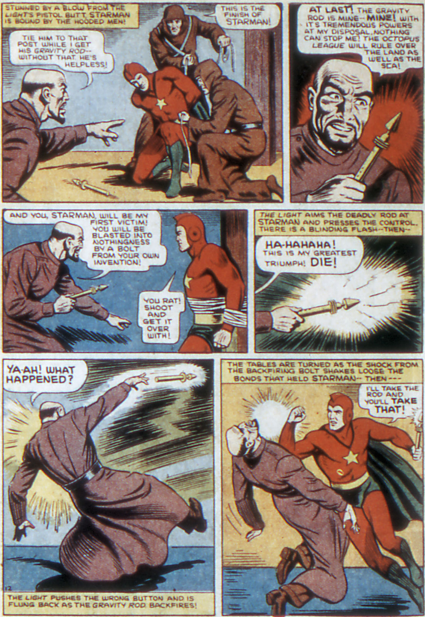 At the climax of their fight, it almost appears that Starman has some degree of mental control over his rod. The text denies this, claiming that the rod returns to his hand from the force of the chain that yanked it from the Mist. 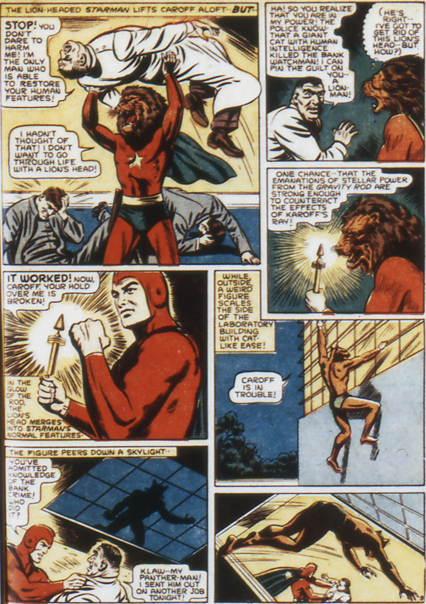 Still, in later years there would be some mental connection between Starman and the rod, and this may be the moment he discovers it. 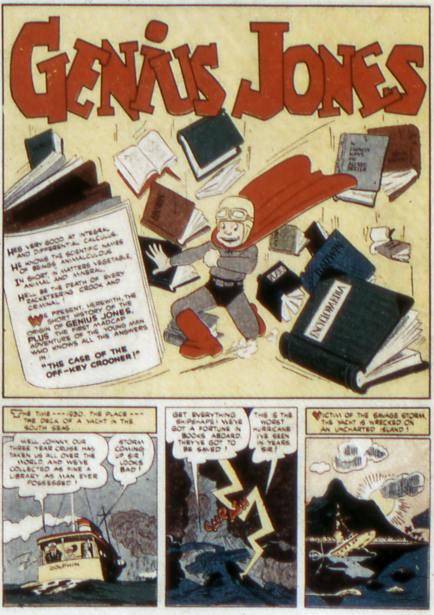 Genius Jones debuts is this issue. 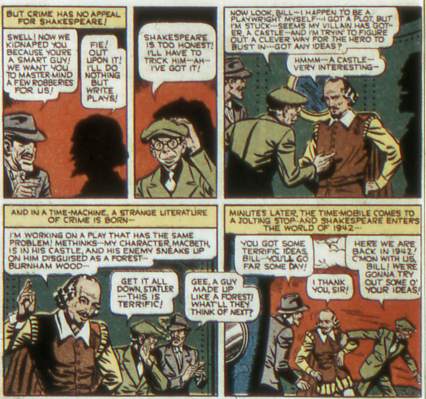 This is a humourous series that I likely would have skipped over, except that Genius Jones would return in the Dr. 13 strip in Tales of the Unexpected early in the millenium, so I am forced to include his original run. He gets shipwrecked on a deserted island, and spends his time until rescue reading. As he is still a child, he clearly did not have decades to read, but somehow managed to learn pretty much everything there is to learn. He opens a consulting booth, charging a dime to adults and 5 cents to children to answer any and all questions. Can’t help but think of Lucy and her psychiatrist stand from Charlie Brown, which may well have been influenced by this. 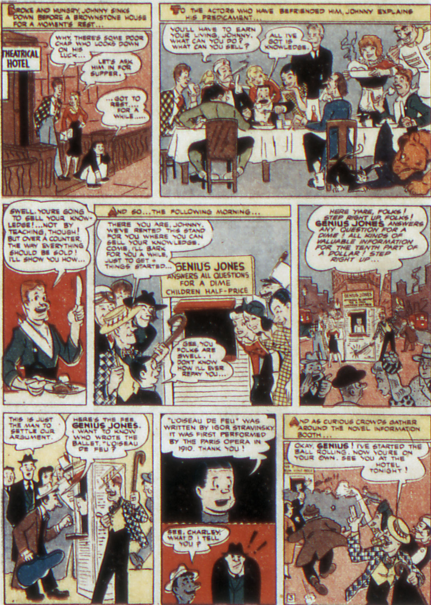 Genius Jones answers questions, solves crimes and generally makes the world a better place, all in a very child-friendly looking strip. But he has no real enemies, or character development, or anything else that might make me reference another one of his stories. So the only other mention he will rate in this blog will be to mark the end of his run. 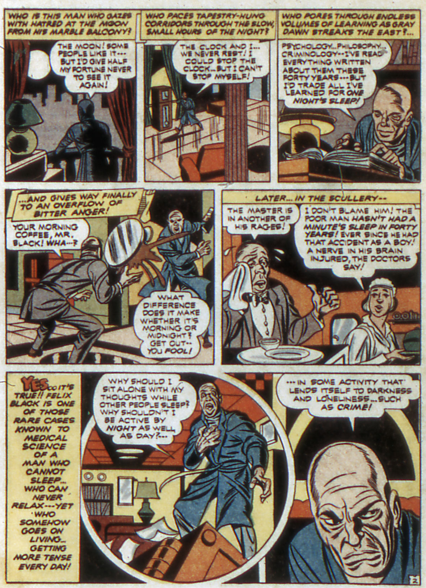 The Sandman story opens with a page of wonderful Kirby art, establishing the wealth and position of the victim of this story. 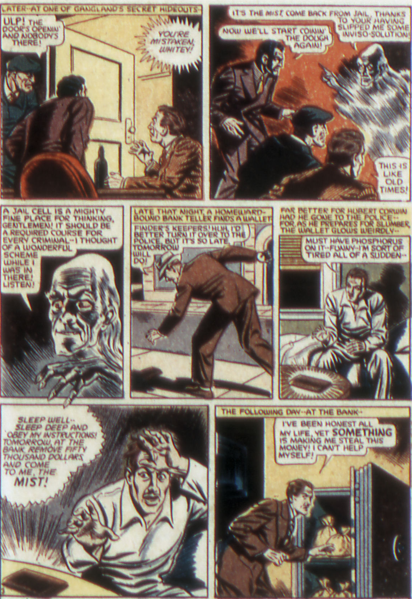 Monroe Alvin is framed for a murder he does not remember committing, despite photographic evidence of his crime. 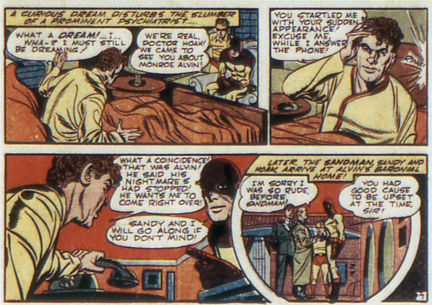 The dream motif had not been used much in the previous few stories, but in this one almost everyone is having prophetic dreams of the Sandman, usually right before he encounters them. 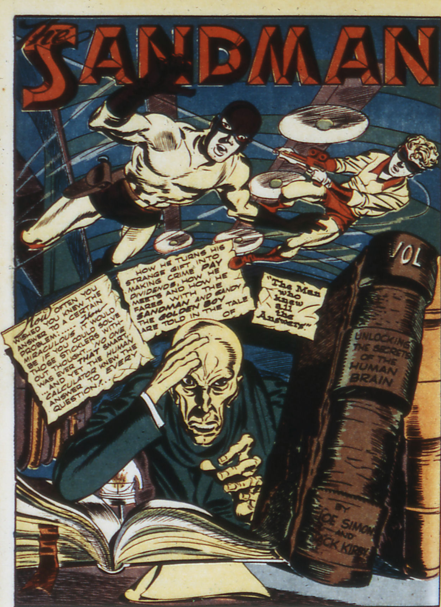 That’s quite a help, as this is a complex case involving fake doctors and amnesia, but Sandman puts it all to rights. Pleasant dreams for all. 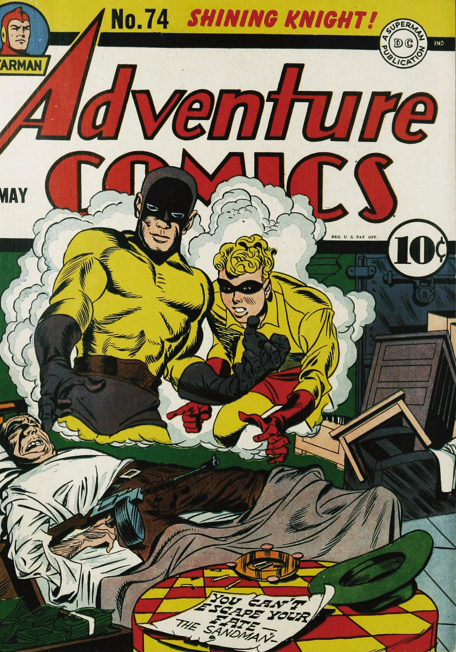 Sandman returns as the cover feature of the book with Adventure 74 (May 42), but is not the lead feature, and I’m just obsessive enough that I need to cover the stories in the order in which they appear, so…. Starman has to deal with another mad scientist, Ivan Karoff, who has developed a machine that transforms men into the animal they most resemble, using them as pawns to commit crimes. 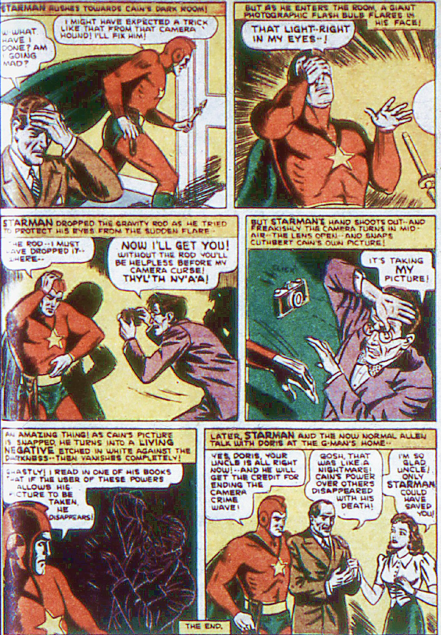 Starman is sent out on the case, but makes a delightful mistake. 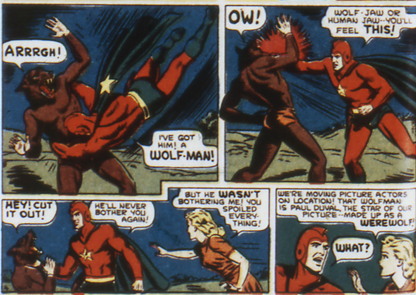 Starman believes he is rescuing a woman from a werewolf created by Karoff, but in fact has simply stumbled across a film shoot. 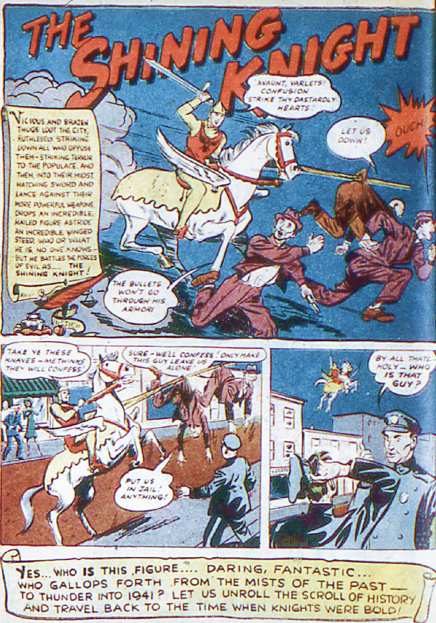 He does manage to find the bad guy, though he gets captured. Karoff stupidly decides to subject the hero to the machine. All that does is bring out the lion in Starman. We also get a sense of the unused potential of the gravity rod, as it is capable of easily transforming Starman back to human. Karoff himself winds up subjected to his ray, which transforms him into a pig. 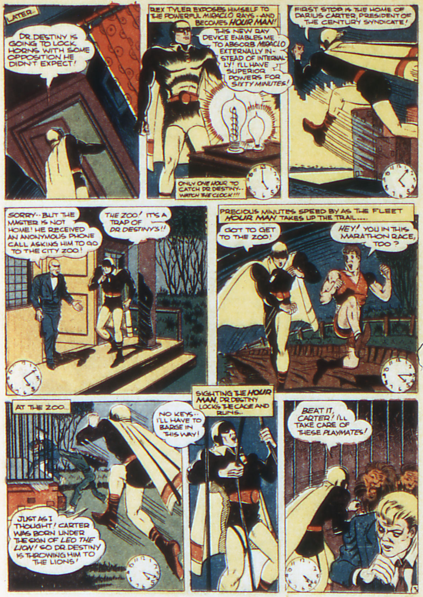 As previously mentioned, Jimmy Martin no longer appears in the Hourman series. 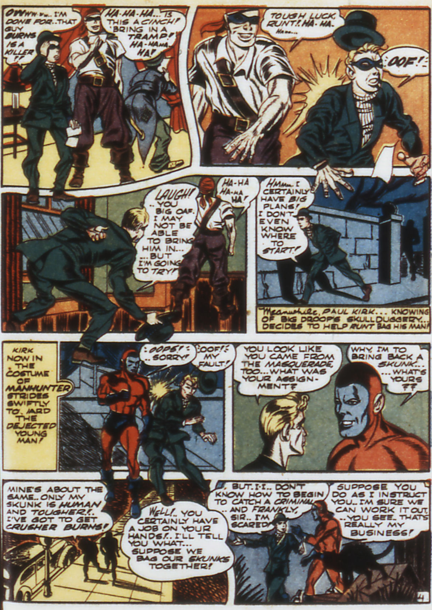 Thorndyke informs Rex Tyler of this, apparently knowing his identity already, which none of the other Minute Men did. 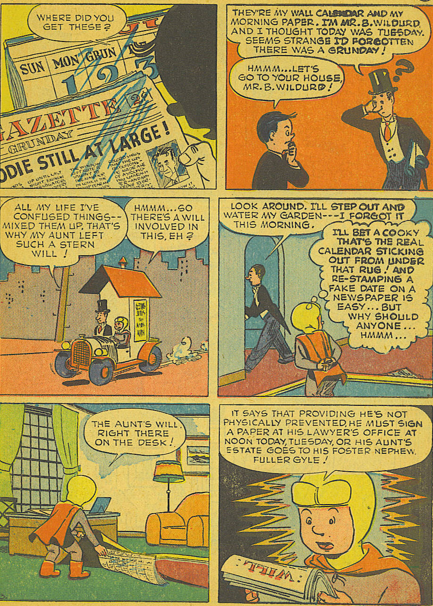 As well, it had previously been established that Thorndyke and Jimmy were brothers, yet issue 75 informs us that Thorndyke’s last name is Tomkins, which is very unusual if he is the younger brother of Jimmy Martin, so perhaps there is more going on here, with the mother taking off with one of her sons and leaving the other behind. Did Jimmy and Thorndyke have different fathers? It’s all very suspicious. 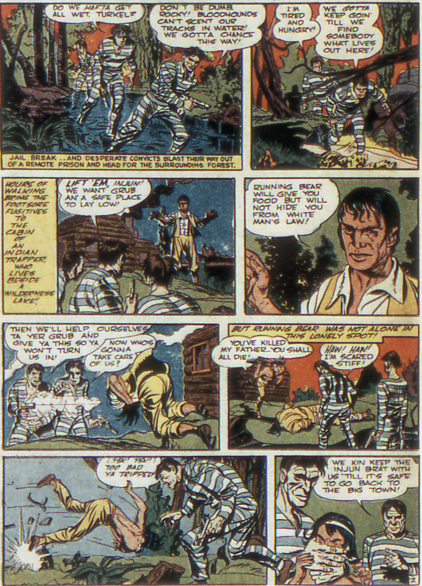 Anyway, with Hourman and Thorndyke both buzzing on Miraclo, they track down thieves Bugs Manders and Gimpty Gowan, getting captured and trussed up for their efforts. It takes them longer than the hour of power that they have, and Hourman has to bluff his way through the final battle, which is sort of impressive, considering the withdrawl he must be experiencing. 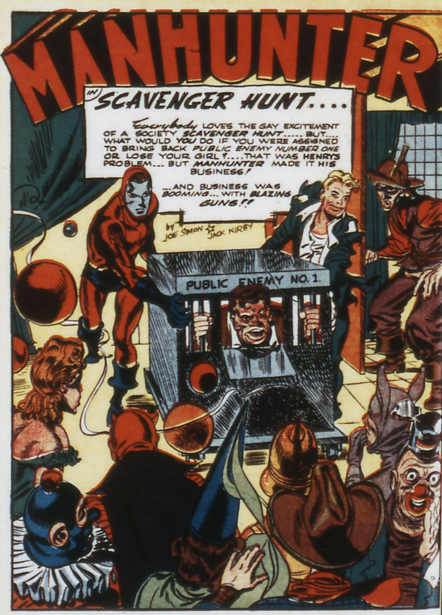 Simon and Kirby refine the Mnahunter outfit, giving Pauk Kirk a blue mask as he joins a society party scavenger hunt. A romantic rivalry at the party is to be decided by the outcome of the hunt, which leads one of the men to rig the hunt, so his rival has to track down and capture a notorious killer. 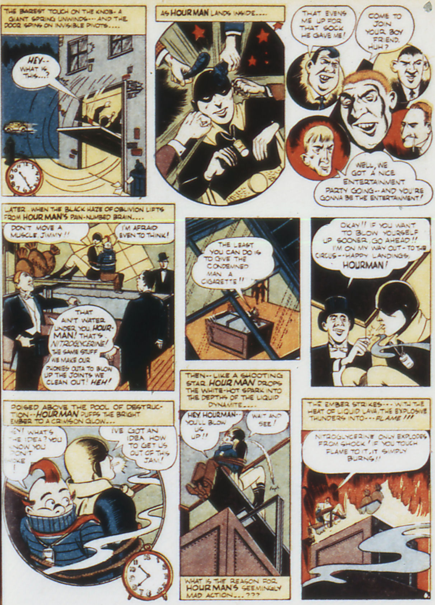 Paul dons his newly masked outfit and does the boy’s work for him, apprehending Crusher Burns, thus winning the boy the shallow girl who wanted the men to compete for her. 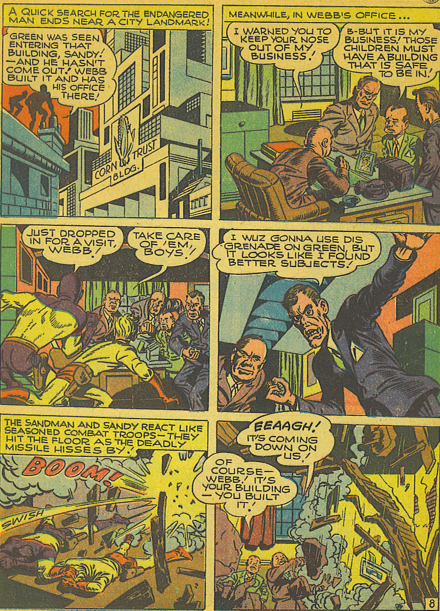 Sandman and Sandy face off against a genius, Hiran Gaunt, who has turned to crime simply for the mental challenge. This is a man who can deduce the combination of a safe, so he really has an amazing brain. 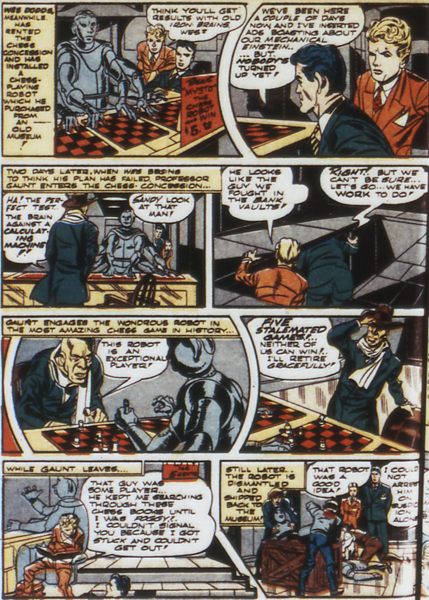 Playing on his pride, Sandman sets up a chess-playing computer, which is really a machine with Sandy stuffed inside of it, as a lure to draw him out. Then it’s simply a matter of trailing him and beating up his gang. Good art on this one, but the dream element does not come into play at all. 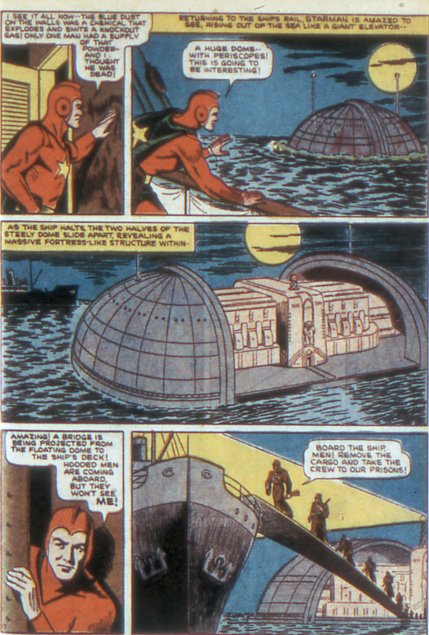 Time machines tend to be spherical in the DC Universe, and the one invented in the Starman story in Adventure 71 (Feb 42) fits the mold perfectly. No sooner has it been tested than hoods knock out the inventor and steal the machine, using it to retrieve futuristic weapons, like a flaming cloud that emits destructive thunderbolts. Starman is so busy dealing with these that he has no time to try to figure out who is behind it all. 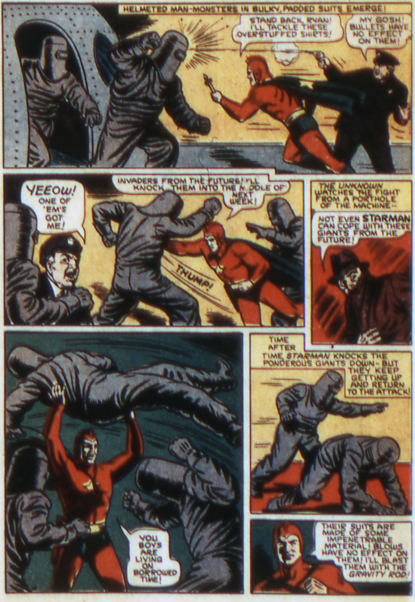 When the weapons fail to kill Starman, the sphere is sent to retrieve people from the future, who are apparently willing and eager to engage in fist fights with their ancestors. They wear ugly grey suits that cover their entire bodies. There is a bit of an explanation for this, when it’s revealed they cannot breathe our air. Which should be much purer and less polluted, and therefore easier to breathe, than their air, but whatever. The Light is revealed as the mastermind. 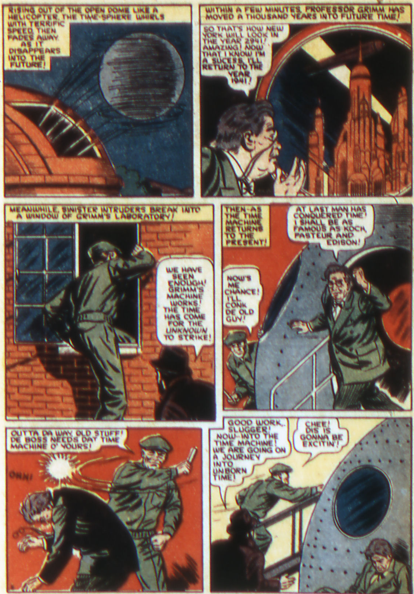 His third battle with Starman, although he seems to have given up inventing things himself, and is now content to steal the inventions of other scientists, present and future. 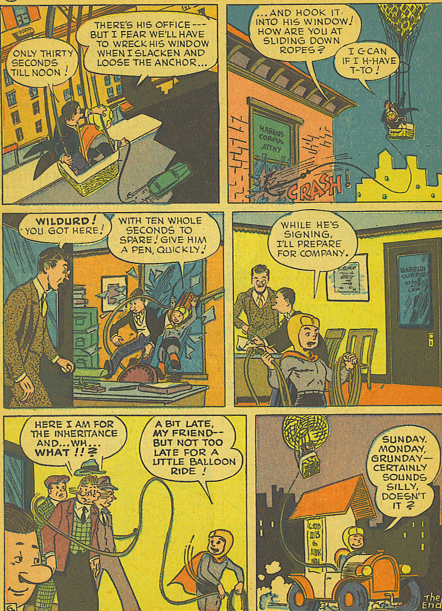 This issue also sees the debut of the Miraclo Ray, which replaces the Miraclo pills. 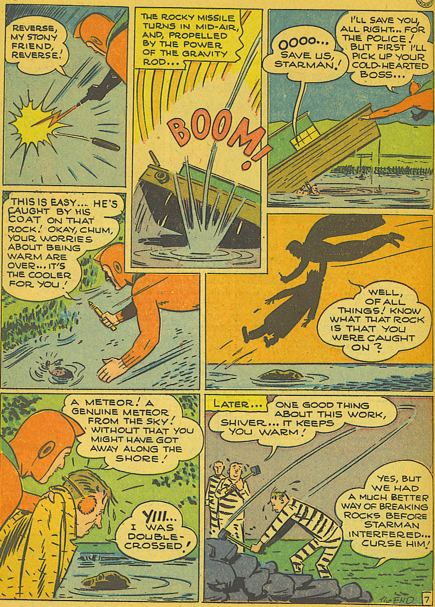 Later writers would ascribe the ray’s powers as activating the Miraclo still in Rex Tyler’s system, but no real explanation of the ray is given in these early stories. This tale also uses the countdown timer to build suspense. 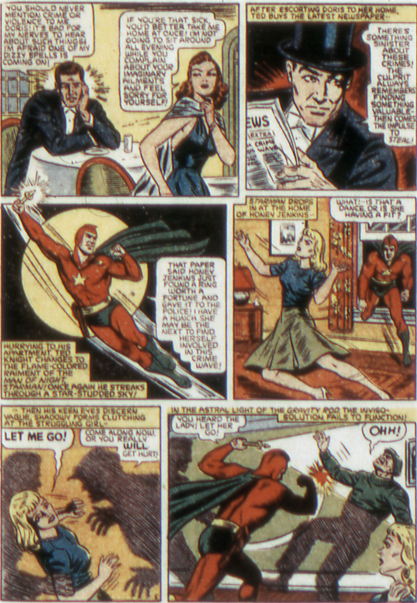 This had been used in some of Hourman’s earlier stories, but hadn’t been featured in quite a while. 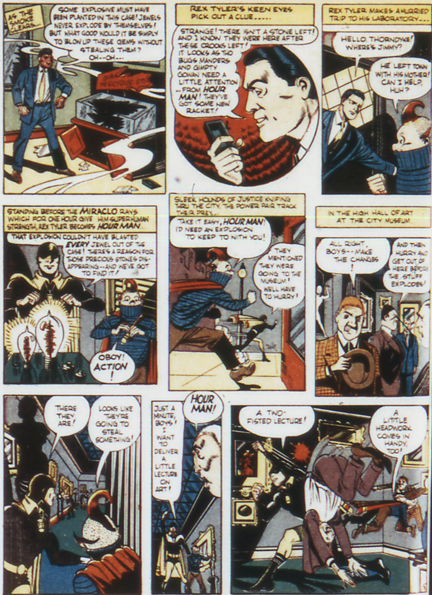 Hourman is facing off against Dr. Destiny, a killer for hire who plans his murders according to the zodiac. 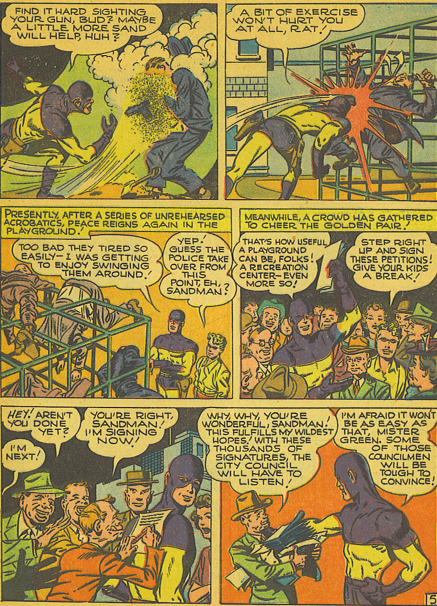 Hourman decks Jimmy Martin out in a matching costume. He does not have the boy stand in front of the Miraclo ray, or even give him a Miraclo pill, so the boy has no powers whatsoever. 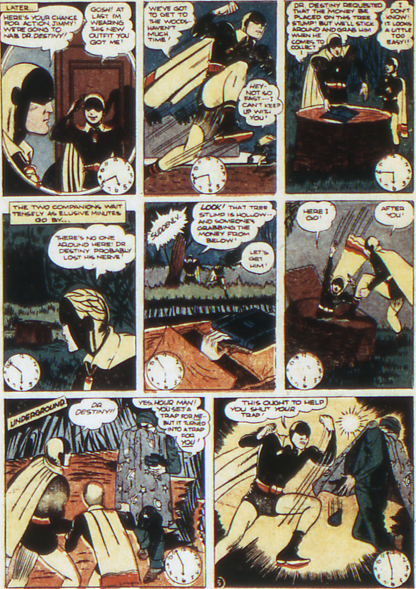 Still, Hourman thinks bringing the kid into a fight with a hired killer is a great idea. 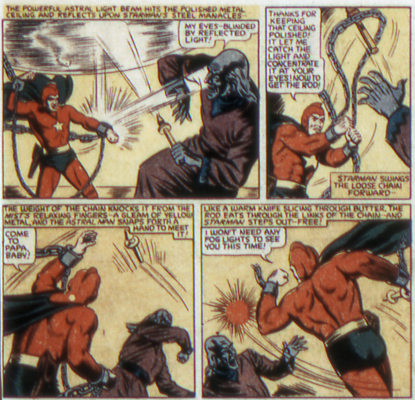 Adventure 66 (Sept 41) sees Starman face off against another mad scientist with an evil invention, this time a voodoo camera that allows the photographer to control those he has taken a picture of. 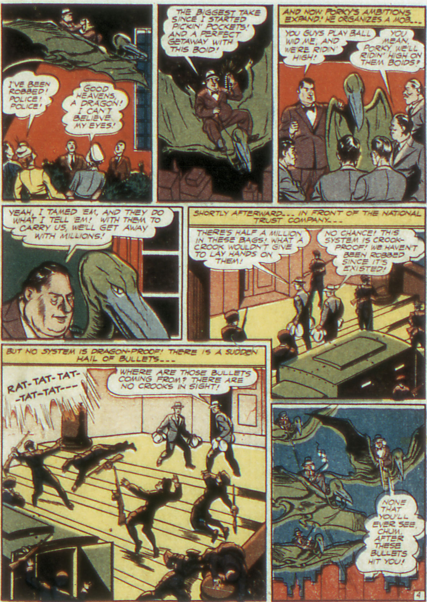 The villain goes out of his way to contact Woodley Allen, to put him under his power in order to prevent the FBI investigating him. That’s a kind of curious way to do things, and it fails significantly, as his niece Doris Lee sees how strangely her uncle is acting, which prompts her to tell Ted, who then becomes Starman and quickly tracks the guy down. Once again butterfingers Starman drops his rod. 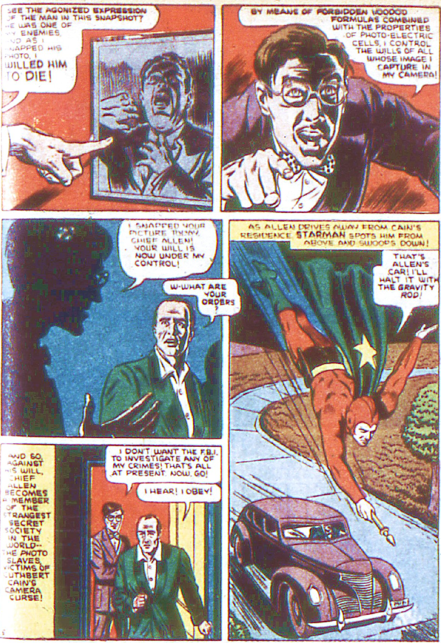 This time he doesn’t even need to the bad guy to try to use it, instead just hitting his hand as he tries to take Starman’s picture, causing him to accidentally take his own photo, which apparently kills him. 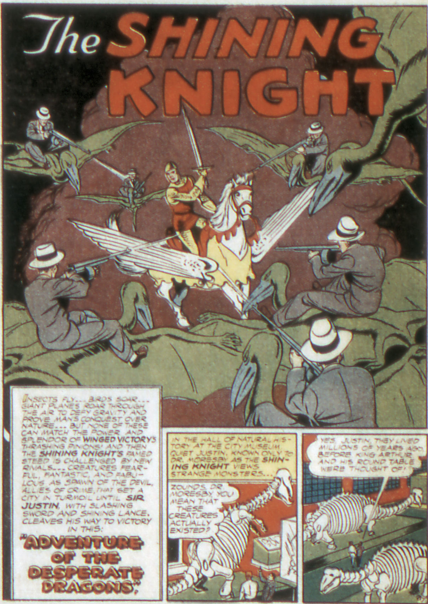 The Shining Knight makes his debut in this issue. 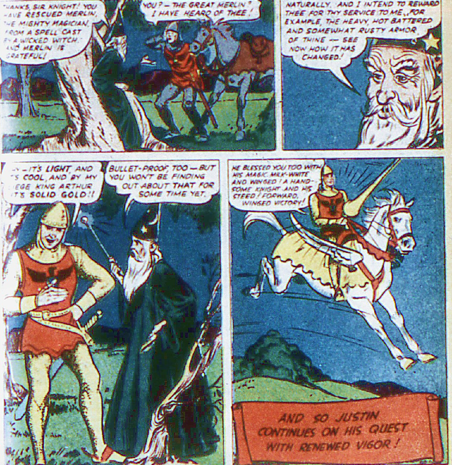 Sir Justin was a knight of the Round Table, given enchanted armour and a flying horse, Winger Victory, by Merlin, shortly before falling into a glacier and being frozen for centuries, emerging just as World War 2 was in full swing. As far as concepts go, this was decent, but as the two pages I have copied here show, the art was not impressive in any way. And for years, neither would the stories be. Despite the fact that England was already at war at this point, and had been for years, Sir Justin shows no interest in defending his homeland. He is content to take on an identity as an assistant to a museum curator (who knows who he really is), and for the most part battle run of the mill thieves and robbers. 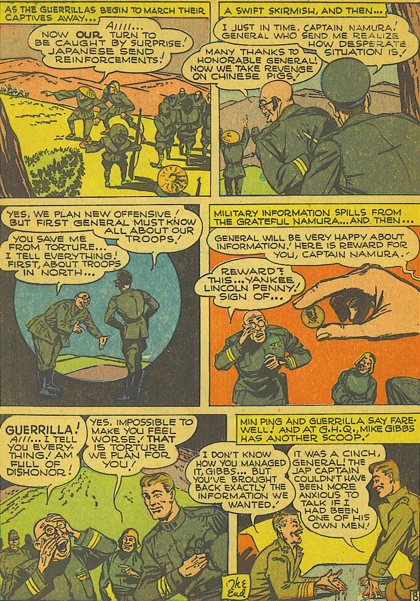 It was only in the 1950s that this series really kicked into high gear. So there will be few mentions of his stories until then. 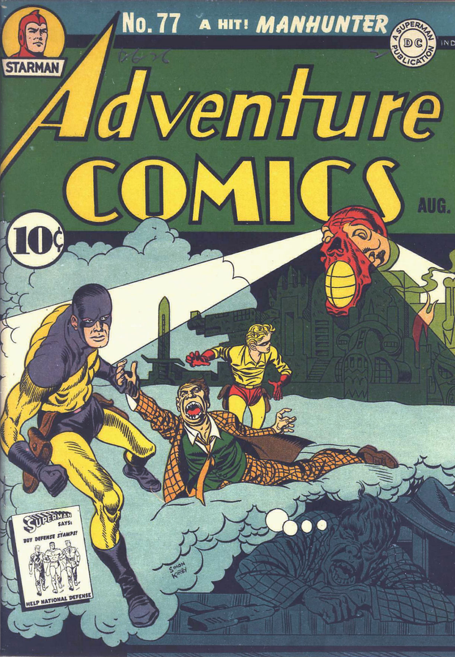 The Light returns, but of course the cover to Adventure 65 (Aug 41) does not reflect this. Why would it? After reports of ships losing control of their ability to steer and being rammed against each other, Starman heads out to sea to investigate, and finds a giant submersible laboratory. 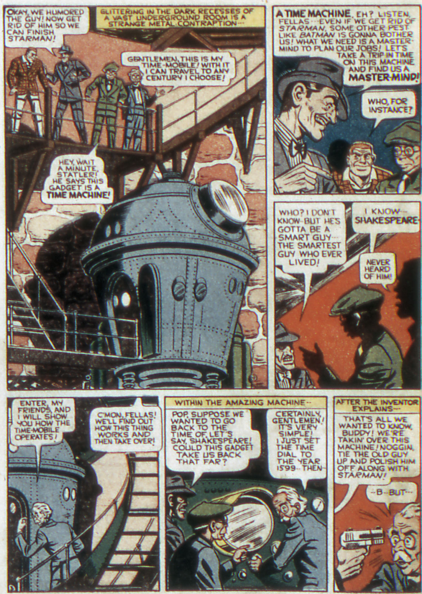 Burnley does a great job with it, but it’s resemblance to the underwater lab in The Invisible Empire storyline from Federal Men makes me suspect both Burnley and Shuster patterned the labs on some earlier work. 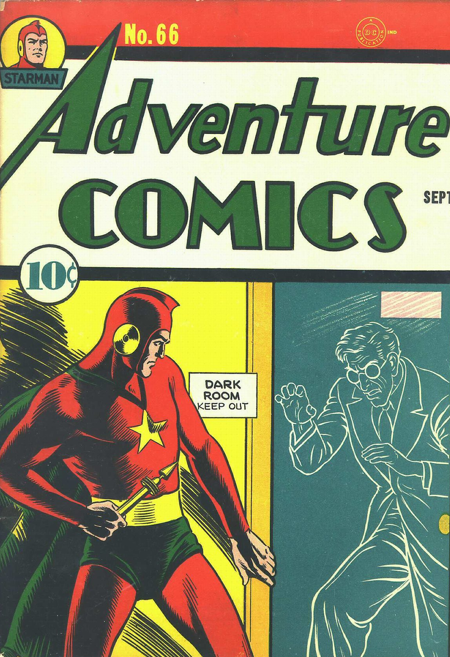 Starman discovers that The Light survived being shrunk, and is the one behind the secret lab and ship destruction. In their battle, The Light manages to retrieve the gravity rod after Starman drops it. The backlash effect is basically identical to Green Lantern’s ring, although it makes an awful lot more sense with a magic ring. 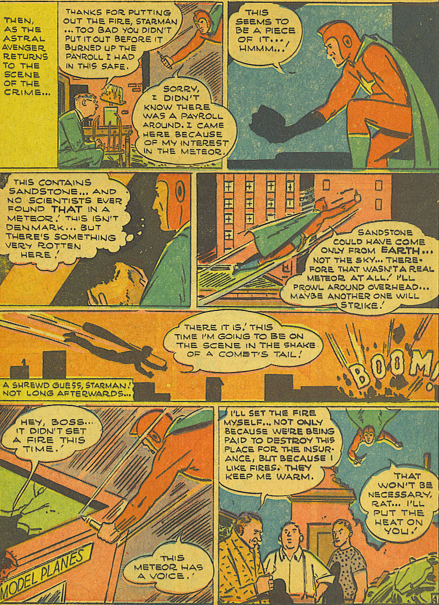 Starman will drop the rod a couple more times in early stories, but finally learns to keep a grip on it. 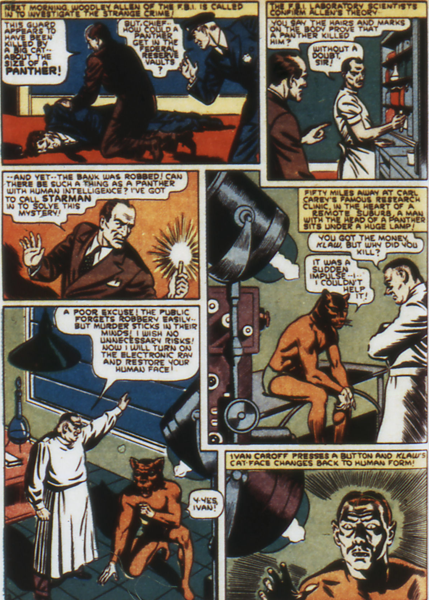 The Light gets sent to prison, but you can never keep a good mad scientist down.